At Thinkful, mentors are partners in code. These seasoned-industry experts work with our students 1-on-1 to help them master the curriculum and find great jobs in tech. Since January is National Mentor Month, we’re excited to celebrate the dedicated mentors of Thinkful’s Engineering Immersion Program. Thank you to our mentors for guiding our students every day! 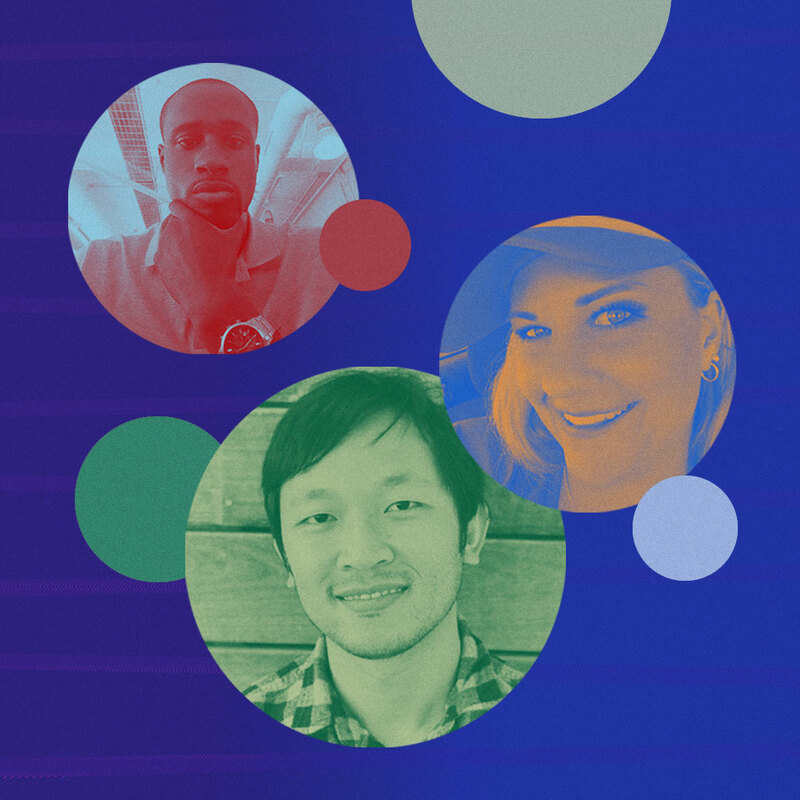 Meet 3 of our software engineering mentors – Koes Bong, Jamie Gammel, and Okemdi Oparaeke – to see how they are committed to student success and why they mentor with Thinkful. What were you doing before you started mentoring with Thinkful? Koes: I graduated with a bachelor’s degree in Management Information Systems and started my post-college career working at a non-profit company as a Database Administrator. Two years after that, I joined a startup and started my journey in the web development industry. I spent most of my career working in the front-end stack before transitioning to an Engineering Manager in late 2013. I now work for Heroku, a PaaS that provides services and tools to build, run, and scale web and mobile applications. Jamie: I’m not your average developer. I’m a female, thriving in a world where I’m a minority. With the challenges I must surpass, the expertise I must spill, I’m the Lara Croft of the Java world! (Or so I like to think…) I graduated with a Computer Engineering Degree with a concentration in Biogenetics. I worked as a Biogenetic Engineer where my patent for decreasing culturing process costs was purchased. I then started working with computers and robotics, and became immersed in the IT industry for 11 years. I’ve worn multiple hats including DevOps Engineer, Lead Java Developer, and Full Stack Engineer. I’m currently a Java Architect at ASSA ABLOY Door Security Solutions, an international company specializing in doors, security, locks and hardware. Koes: I enjoy coaching and mentoring in my role as an Engineering Manager, so when the opportunity presented itself for me to help mentor folks looking to transition into the software industry, I thought I’d give it a shot. Jamie: Mentoring is part of my legacy – I want to inspire, share my skills, knowledge, and expertise. I feel a great sense of purpose knowing that I help people change their lives. Mentoring is the reason I continue to grow, both in my professional career and my everyday life. Most would expect that the mentee is the only one learning and growing, but it’s a two way street. We hold each other accountable – I am confident, process driven and successful because of my mentor/mentee relationships. Human connection is why I mentor. Okemdi: In the past, I’ve had teachers and other peers tell me that I didn’t have the best skills to become a Software Engineer, but I was able to prove them wrong. I have a passion for using technology to make functional software applications. And I find satisfaction in helping individuals discover and learn new skills in the tech industry. Instead of bringing others down, I want to motivate and uplift students who want to pursue careers in computing. Why did you decide to mentor with Thinkful specifically? Koes: All the coding bootcamps I knew about offered in-person courses. So when I was approached to do mentoring online through Thinkful, I was intrigued. I’m so glad I decided to join because I love how invested everyone is in the students’ success. Okemdi: After researching the wide range of software development topics taught at Thinkful, I decided to offer my expertise because Thinkful is one of the few coding bootcamps that gives students an invaluable offering – 1-on-1 mentorship with industry developers. How would your students describe your mentoring style? Okemdi: My students would say I have a steady and relaxed teaching style. They don’t feel pressured by me, but I don’t spoon-feed answers either. I guide them on the right path to figure out solutions on their own. Guidance always helps, but you can retain information a lot better if you have the chance to figure out problems on your own. What makes you smile as a mentor? Describe a student success story. Koes: One thing I’ve been doing a lot of is helping current students or graduates prepare for interviews. It’s such a thrill to hear back from them when they ace their interviews or, even better, get an offer. Jamie: One of my former mentees is a brilliant, self-motivated software developer. Our mentor sessions consisted of sharing, developing, and debugging. He answered his own coding questions, had the ability to solve his own debugging problems, and continued on with his explorations, teaching himself Java. He achieved his goal, and accepted a position as a developer with my current team! Okemdi: Every time a student tells me they received a new position, it’s a success story in my book. I‘ve had students reach back out to tell me about their new positions and to thank me for helping them though the course. It’s very gratifying to know I made an impact in helping students land careers in the tech industry. Why should other tech professionals mentor? Koes: Being able to be a mentor and watch students flourish is such an invaluable experience. You will mentor others who have decided to change careers, which is a very scary and courageous thing to do. So if you’re looking for another way to give back, mentoring is one of them. Okemdi: As professionals in the tech industry, we learn a lot of specific skills that are only known to those who work in the industry. Sharing this information with others could help alleviate some of the unknown expectations on the job. It could also make development roles seem less daunting and intimidating. Mentoring helps entry-level developers become much more efficient from the beginning since they already know some of the tricks/tools of the trade. Want to see what students say about their mentors? See how 3 students changed careers with a mentor. Interested in reading more mentor stories? Check out our interview with Thinkful mentor Sara Chipps - CEO of Jewelbots and Co-Founder of Girl Develop It. Read More. Ready to start your tech career with a 1-on-1 mentor at Thinkful? Speak with an Admissions Advisor today.